РЕТ straps are applied for strapping industrial products of different weights and shapes in a wide range of industrial sectors. The unparalleled properties of polyester make it one of the best strapping materials for stacked and palleted cargo. РЕТ strap is now widely used for packaging of products in wood sawing and wood working industries (packaging of sawn timber, fiberboard, chipboard, plywood, cardboard, paper), of construction materials (bricks, tiles), glass containers etc. Polyester straps (РЕТ) are used for strapping industrial goods of different forms and sizes. 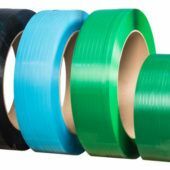 Polyester unique qualities make it one of the best strapping materials for stacked and packed loads, that’s why today PET strap is widely used for strapping various products: lumber, fibreboard, chipboard, plywood, cardboard, paper, bricks, tiles, glassware, etc.